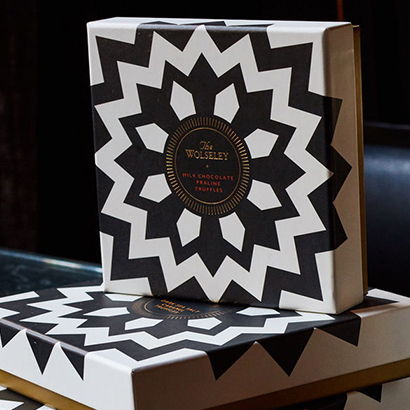 When creating these indulgent truffles, The Wolseley enlisted the help of an artisan chocolatier, who brought their Royal Warrant-approved expertise to this delicious recipe. A fine 60% dark chocolate shell encases a centre of sweet caramel infused with sea salt, and each truffle is hand-finished with white chocolate marbling. The box is decorated with a black, white and gold chevron design inspired by the grand café’s marble flooring and contains 16 decadent truffles, making it the perfect dinner party treat. Allergens: May contain traces of Egg, Wheat, Barley, and Nuts. Ingredients: Dark Chocolate (Cocoa Mass, Sugar, Cocoa Butter, Emulsifier: Soya Lecithin), Whipping Cream (Milk), Sugar, White Chocolate (Sugar, Cocoa Butter, Whole Milk Powder, Emulsifier: Soya Lecithin; Natural Vanilla Flavouring), Glucose Syrup, Water, Sea Salt, Acidity Regulator: Citric Acid, Preservative: Sorbic Acid.